"Combat Veteran Lives Here; Please be Courteous with Fireworks." Signs like that are appearing in neighborhoods across the country as awareness of the lingering effects of Post Traumatic Stress Disorder is growing. The Bay County Veterans Office recently was contacted by a veteran who suffers from PTSD, seeking advice on where he can get away from the loud noises from the Fourth of July Fireworks Celebration that Bay City stages each year. One of the outlying counties where official fireworks displays are not held might be his best bet, officials informed him. Actually, the community fireworks are not the major concern, but unofficial fireworks being shot off in neighborhoods without warning are the real problem, some veterans say. "If you don't know the blast is coming, the effects are much worse," one Vietnam veteran says. "Besides, aren't those rogue fireworks celebrations illegal in Michigan?" The Bay Veterans Foundation is seeking to spread awareness about the danger in the wake of a report that vet who recently had a breakdown at a party when fireworks were suddenly exploded. "All of a sudden he was on the ground, covering his head, ruining the party for him," a witness reportedly said. "This is a serious matter for some combat veterans who have experienced severe trauma, mainly those who served in Vietnam," said one BVF official, adding: "It's not really neighborly to set off huge bombs, or even smaller explosives without warning no matter who lives nearby." Vets who fear sudden noises may opt to get ear coverings, much like audio headphones, a county official suggests. Animals also often have a fear of sudden blasts nearby and activists often express concern for our furry friends who may be startled and suffer adverse effects. This is not a minor problem for veterans, according to extensive news and social media reports. 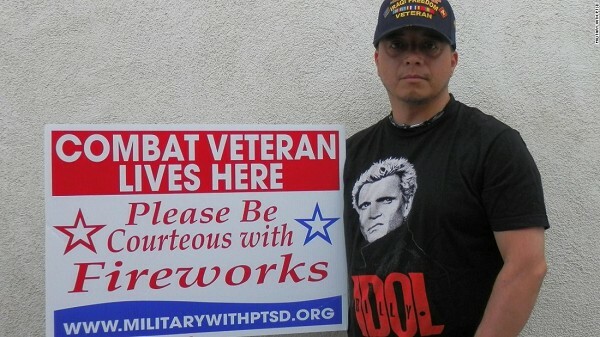 "A reminder of war's lasting effect flashed across social media today as a photo of a veteran standing behind a sign expressing concerns about fireworks and the emotional trigger of nearby explosions spawned an outpouring of reaction. "In less than 24 hours, more than 100,000 people shared the Facebook post, many of them veterans acknowledging the challenges of neighbors shooting off fireworks without thinking of the consequences of those nearby. "Combat veteran lives here, please be courteous with fireworks," reads the poster held by a bearded veteran in the photo that went viral Tuesday and Wednesday. "It's a nice statement that people are picking up and sharing that," says Barbara Van Dahlen, a Washington, D.C. area psychologist and founder of Give An Hour, which provides free behavioral health counseling to troops, veterans and their families. "The sensitivity here is that if you know that your next-door neighbor served ... and you're planning to have a fireworks display in your backyard, it's probably the thoughtful thing to do to let them know," she says. "Emotional reactions to loud noises or sounds that bring memories of traumatic events can be very common among veterans and non-veterans, she says. In the most severe cases, where these reactions or memories are strong a recur over time can they amount to a diagnosis of post-traumatic stress disorder. "In either case, she says, the concern is not that a veteran might react violently, but that the fireworks "could send somebody into a very painful, stressful, emotional experience remembering a firefight or a buddy who was killed." The bottom line is that we as Americans need to be mindful of the veterans who have suffered PTSD in the service of our country. Isn't that the least we can do to fulfill the gratuitous comment: "Thank you for your service."